If the biggest day in college football was last month’s national championship game, the second biggest day might be yesterday’s National Signing Day, the first day that high school seniors can announce where they’ll play football in college. Like many before it, this year’s National Signing Day was full of stories about schools competing over players, and players deciding between their local school or a team across the country. Many news outlets like to analyze the smaller trends in these commitments: What does it mean for Alabama, for the Pac-12, for new Penn State coach James Franklin? However, yesterday’s signings—including a few surprises by Southern players committing to schools in the Pac-12—are only a small part of the much broader evolution of college football recruiting. Rather than ask how recruiting has changed from last year to this year, I wanted to understand how recruiting patterns have shifted over the last several decades. Which teams and conferences are expanding their reach? And which ones are losing ground? The interactive map below allows you to explore these questions. It shows 90 years of D-I recruiting history, by conference and by team. In addition to showing how recruiting distributions have shifted over time, it also shows the geographic center of each team’s and conference’s recruits. By scrolling through different times, you can see how recruiting patterns have changed from 1920 to today. Unlike previous maps which showed every team’s full roster, this map only shows those college players who also played in the NFL. While this shows a much smaller sample of players than maps of full rosters, it likely gives a more accurate picture of the recruiting reach of college football teams and conferences—a program’s ability to recruit is better measured by how well it attracts the best talent from across the country, not how well it attracts marginal players who few other schools are courting. As the map shows, the center of the college football moved from northern Indiana in the 1920s to northern Arkansas today. This move is mostly unsurprising—it closely mirrors the movements of the U.S. population. Because the South is overrepresented in college sports, football players' center is a bit further south than that of the general population. This raises an interesting question: As major conferences have turned their recruiting attention to the South, are football programs now fighting over more and more of the same talent? It appears possible, particularly for schools in the ACC. Since the 1970s, the geographic centers of the ACC, SEC, and Big 12 have been moving closer together, suggesting that these conferences are now recruiting from increasingly overlapping territories. For example, compared to four decades ago, the center of the ACC is now 180 miles closer to that of the SEC and 140 miles closer to that of the Big-12. However, these shifts toward one another could be offset by conferences expanding their recruiting reach. While the ACC and SEC are both becoming centered in the South, the two conferences could also be recruiting more broadly across the country, providing both with access to more players. Therefore, while the ACC, SEC, and Big-12—and to some extent, Big Ten—are moving closer together, they’re also all attracting players from farther away. This suggests that these three conferences are becoming increasingly more national and less representative of their home regions. Interestingly, while the other four major conferences have widened and moved closer together, the opposite is true for the Pac-12. 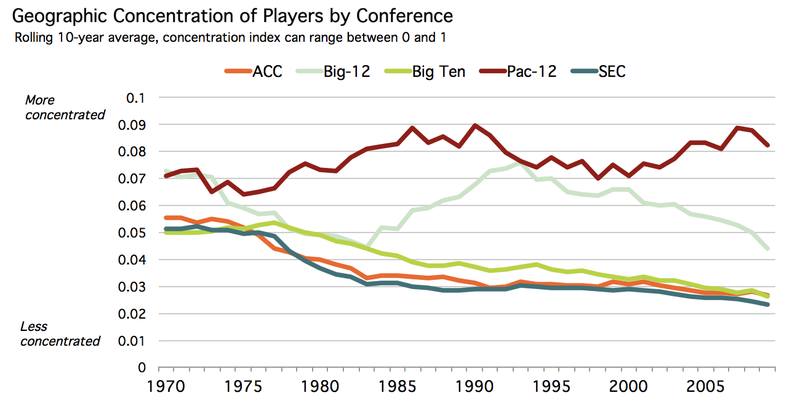 Not only has the center of the Pac-12 moved about 250 miles away from the centers of other conferences, but the conference is also the only one that hasn’t become less concentrated. It seems that the Pac-12 is content to let other schools fight for players on East coast and focus their efforts—successfully, it appears—on West coast talent. From this perspective, yesterday’s signing day, in which the Pac-12 signed several top players from the South, may have been an anomaly. But it remains to be seen, after the recent success of the South in college football, if these historic trends will hold up. Player data from 1920 to 2000 was collected from DatabaseFootball.com; data from 2000 to 2009 was collected from NFL.com. Information on conference membership was provided by the New York Times. Hometowns were matched to counties using data collected from the National Association of Counties. County location data was calculated from zip code location data provided by Gaslamp Media. Conference centers and measures of geographic diversity were calculated in SQL. 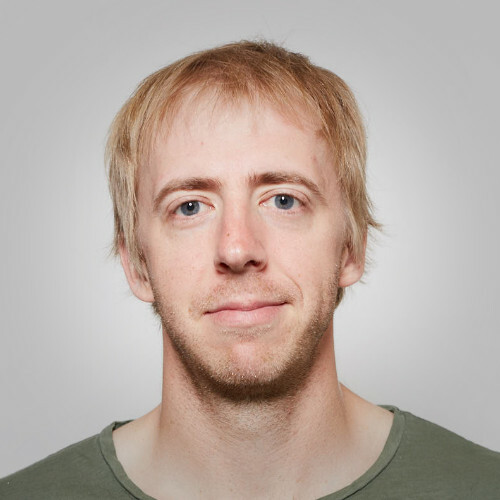 All of the data collection tools, SQL analysis, visualization code, and data, including a full list of all the players shown on the map, can be found in this GitHub folder. Collecting and combining this data was actually a fairly complicated process; if anyone would like to know more about how it was gathered, I’d be happy to answer any questions. As mentioned above, the map and analysis only includes college players who were on an NFL roster at some point in their career. This potentially creates some problems—for example, the percentage of college players from the South that go to the NFL could be higher than that for college players from other parts of the country. Nevertheless, as far as I know, a full list of historic college football players and their hometowns isn’t available. If you know of a dataset with this information, I’d love to hear about it.